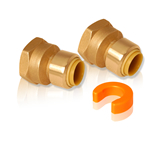 Our lead free male pipe fitting adapters are can be used on PEX, CPVC or Copper. They require no tools or special training to use. In a matter of seconds, you can connect the lead free adapter. Highly versatile and perfect for a variety of applications including hot water, chilled water, potable water, fluid transfer and more. 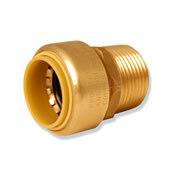 Straight Female Push Connect™ Adapter Straight Female Push Connect™ Adapter 1/4PC x 1/4" FNPT Lead Free Push Connect Tee 3/8" x 3/8" x 3/8"
Quick Connection 1" PC Endstop 1/2" x 3/8" OD Comp. x 3/8" OD Comp., 3-way, Chrome Plated 1/4 Turn Push Connect™ Stop Valve Tee, Lead Free High Torque Premium Tube Cutter : Built in tube reamer, file & spare cutter 1/8"- 1 1/2"